Grand Duke Alexei Alexandrovich of Russia,(Russian: Алексей Александрович; St. Petersburg 14 January 1850 (2 January O.S.) – Paris, 14 November 1908) was the fifth child and the fourth son of Alexander II of Russia and his first wife Maria Alexandrovna (Marie of Hesse). Destined for a naval career, Alexei Alexandrovich started his military training at the age of 7. By the age of 20 he had been appointed lieutenant of the Imperial Russian Navy, and had visited all Russia's European military ports. In 1871, he was sent as a goodwill ambassador to the United States and Japan. In 1883 he was appointed general-admiral. He had a significant contribution in the equipment of the Russian navy with new ships and in modernizing the naval ports. However, after the Russian defeat in the Battle of Tsushima in 1905, he was relieved of his command. He died in Paris in 1908. The Grand Duke Alexei Alexandrovich Romanov of Russia was born in Saint Petersburg on 14 January 1850 (4 January O.S.). He was the son of emperor Alexander II and empress Maria Alexandrovna. He was a younger brother of Grand Duchess Alexandra Alexandrovna, Tsarevich Nikolay Alexandrovich, Alexander III of Russia, Grand Duke Vladmir Alexandrovich. 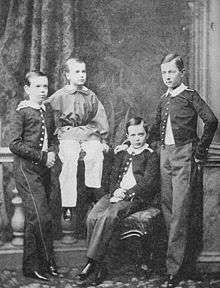 He was an older brother of Duchess Maria of Saxe-Coburg and Gotha, Grand Duke Sergei Alexandrovich and Grand Duke Paul Alexandrovich. in 1866 the frigate Oslyabya during an extensive training cruise to the Azore Islands. On 18 September 1866 Grand Duke Alexei was promoted lieutenant. He continued his navy career serving as officer aboard the frigate Alexander Nevsky on a cruise in across the Mediterranean to Piraeus, where he attended the wedding of his cousin Olga Konstantinovna. In 1868 he went on a trip to southern Russia traveling by train from Saint Petersburg to Nikolayevsk, continuing by ship down the Volga to Astrakhan. He then boarded a military ship for a cruise on the Caspian Sea to Baku, [Petrovsk (now Makhachkala) and then to Iran. He then crossed the Caucasus and reached Poti where the Alexander Nevsky was moored. From there he sailed to Constantinople, Athens and the Azore Islands On the return voyage, on the frigate was wrecked off the coast of Jutland during a storm on the North Sea. Though the ship was lost, the crew including Alexei Alexandrovitch except five men was unhurt and could safely reach the shore. In January 1870 Alexei Alexandrovich reached the age of majority according to Russian legislation. The event was marked by taking two oaths : the military one and the oath of allegiance of the Grand Dukes of the Russian Imperial House. In June 1870 Alexei Alexandrovich started the last part of his training. This included inland navigation on a cutter with a steam engine, on the route from Saint Petersburg to Arkhangelsk through the Mariinsk Canal system and the Northern Dvina River. After visiting the schools and industrial facilities of Arkhangelsk, he started his navigation training in arctic conditions, aboard the corvette Varyag. His cruise took him to the Solovetsky Islands, continuing through the White Sea and Barents Sea to Novaya Zemlya. The route continued to Kola Bay and the city of Murmansk, the ports of northern Norway and Iceland. He returned to Cronstadt at the end of September. 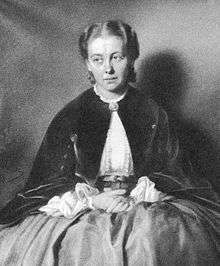 In 1869/1870, Alexei had an affair with Alexandra Zhukovskaya, daughter of poet Vasily Andreyevich Zhukovsky, who was eight years older than he was. 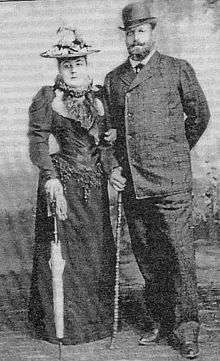 They were parents to a son, Alexei, born on 26 November 1871. Tsar Alexander II was strongly opposed to this relationship. Some historians claim that they were morganatically married and that the marriage was annulled by the Russian Orthodox Church, because, according to the "Fundamental Laws of the Imperial House", this marriage was illegal. However, articles 183 and 188, which prohibited marriages without the consent of the emperor, were included in the Fundamental Laws only by the 1887 revision under Tsar Alexander III. The rules valid in 1870 did not prohibit morganatic marriages, but simply excluded their offspring from the succession to the throne. There is no evidence either to the marriage or to the divorce. There is also no evidence that the Grand Duke even requested the permission to marry. As Alexandra Zhukovskaya was not an aristocrat and, besides, the daughter of an illegitimate son of a Russian landowner and a Turkish slave, such a marriage would have been unthinkable. Upset by his son's affair, Alexander II even refused to grant Alexandra Zhukovskaya a title, which would have officially recognized the Grand Duke's paternity, even if illegitimate. Other European courts also refused to grant her a title. As a solution of last resort, on 25 March 1875 Alexandra was able to secure the title of Baroness Seggiano from the Republic of San Marino, with the right to transmit the title to her son Alexei and his firstborn male descendants. It was only in 1883, that Alexander III, the Grand Duke's elder brother, granted the Baron Seggiano the title of Count Belevsky, and in 1893 approved his coat of arms. The Russian squadron, under the command of Admiral Konstantin Nikolayevich Posyet on board the frigate Bogatyr, included the frigates Svetlana and General-Admiral, the corvette Ignatiev and the gunboat Abrek. The Grand Duke was serving as lieutenant aboard the Svetlana. Before reaching the United States, the Russian squadron was to be met by the frigate Vsadnik of the Russian Pacific Fleet. Though all ships were equipped with steam-engines, the squadron made the passage to America mainly under sail, so as to avoid making port on the route for coal supplies. Except for the Grand Duke's personal staff, the crew included 200 officers and over 3000 sailors. The squadron set sail out of Kronstadt on 20 August 1871. The squadron first stopped in Copenhagen, where the Grand Duke paid a visit to King Christian IX of Denmark. In the English Channel the Russians were met by a squadron of the Royal Navy and escorted to Plymouth, where the Grand Duke was met by the Duke of Edinburgh Alfred of Saxe-Coburg. A visit to Balmoral Castle had been scheduled, but had to be canceled because the Prince of Wales was very sick and Queen Victoria extremely concerned. The Russian squadron set sail from Plymouth on 26 September. and, en route to New York, stopped for a few days in Funchal, (Madeira Islands), leaving on 9 October. The Russian squadron was met by an American squadron under the command of Vice-Admiral Stephen Clegg Rowan, Port Admiral of New York, hoisting his flag on the frigate USS Congress. 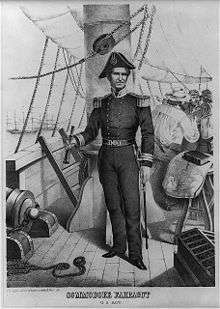 Admiral Samuel Phillips Lee, commander of the North Atlantic Squadron attended on his own flagship, the USS Severn. The other ships of the squadron were the USS Iroquois and the USS Kansas, attended by several tugs. On 22 November, the Grand Duke left for Washington, D.C. by special train, placed at his disposal by the New Jersey Railroad and Transportation Company. The train had three cars: the "Commissariat" having all the modern improvements of a hotel, comprising store-rooms and pantry, the "Ruby", dining room car to accommodate 28 persons, with kitchen, ice boxes, and a sort of wine cellar, and "The Kearsarge" used as sitting, sleeping and reading room. On 23 November, the Grand Duke was received by president Ulysses S. Grant. The president's wife, Julia Grant, and his daughter, Nellie Grant, also attended. Most of the members of the cabinet were present at the meeting: Hamilton Fish (United States Secretary of State), Columbus Delano (United States Secretary of the Interior) with his wife, Amos Tappan Akerman (United States Attorney General) with his wife, George S. Boutwell (United States Secretary of the Treasury), George Maxwell Robeson (United States Secretary of the Navy), General Frederick Tracy Dent (the president's brother-in-law and military secretary), John Creswell (Postmaster General of the United States), as well as generals Horace Porter and Orville E. Babcock . The Grand Duke arrived at 1 p.m. in company of minister Katakazi, Admiral Posyet, and other members of his suite. The president and the members of the cabinet received them in the Blue Room where the presentations were made. The president then escorted the Grand Duke to the Red Room where he was introduced to the ladies. The interview lasted only fifteen minutes, after which the Grand Duke left. The visit to Washington was overshadowed by President Grant's discontent caused by the Russian government's refusal to recall Konstantin Katacazi, minister plenipotentiary of Russia to the United States. The entire visit in Washington lasted only one day. No formal entertainment was given in Washington to the Grand Duke, though for all other visits of members of royal families to the White House, formal dinners had been organized. Such dinners had taken place when President John Tyler received François d'Orléans, prince de Joinville, when Abraham Lincoln received Prince Napoleon Joseph Bonaparte and even when Ulysses Grant received Kamehameha V, king of the Sandwich Islands. The evening of the visit to the White House, the Grand Duke and his suite dined at the minister Katakazi's residence, the only American official attending being general Porter. At his departure the Grand Duke was asked if he intended to return to Washington. Though he expressed his interest to return during a session of Congress, the uneasy diplomatic relations due to Minister Katakazi prevented this from happening. There had also been expectations that a military alliance treaty between the United States and Russia would be signed during the meeting; however this was not the case. In New York, the Grand Duke visited the Brooklyn Navy Yard, Fort Wadsworth and the fortifications on Governors Island. He also reviewed the Fire Department at Tompkins Square. A highlight was the trip by steamer on the Hudson for the visit of the United States Military Academy, West Point. Several balls were organized in his honor, the most important being the grand balls at the Navy Yard and at the Academy of Music. Alexei also attended opera performances of Faust and Mignon at the Academy of Music. He also went on a shopping spree, stopping at the A.T. Stewart and Tiffany stores where he bought some jewellery and bronze statues. On 2 December 1871, a ceremony took place at the National Academy of Design, where the Grand Duke was received by Samuel F. B. Morse, William Stoddard, William Page, Albert Bierstadt and several other artists. The painting Farragut in the shrouds of the Hartfort at the battle of Mobile Bay by William Page was handed over to Grand Duke Alexei as a gift of the citizens of New York for Tsar Alexander II. General John Adams Dix presented the picture and the accompanying scroll, with a brief address in which he expressed the hope that it would further cement the union that existed between the United States and Russia. The painting was placed on board the Russian flagship for transportation to Russia. On 3 December 1871, the Grand Duke Alexei left for Philadelphia where he was received by general George Meade and Admiral Turner. He visited Girard College, Baird Locomotive Works and the Navy Yard. He was particularly interested by the Methodist Fair at the Horticultural Hall, where the ladies presented him an Afghan Hound. From 7 to 14 December, Grand Duke Alexei stopped in Boston where he stayed at the Revere House. The landau which President Lincoln rode during his visit to Boston, was prepared for the Grand Duke. He was officially welcomed at the City Hall and the State House. During his stay, the Grand Duke visited Harvard University and the suburb of Cambridge, Massachusetts as well as different public schools in the Boston area, being extensively briefed on the American education system. Other highlights were the battlefield of Bunker Hill and the visit to the shipyards of Charlestown, Massachusetts. On 17 December, the Grand Duke left by train to Canada. 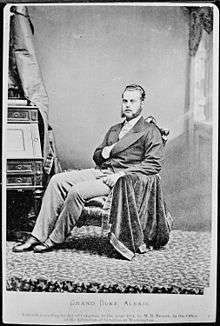 He first stopped in Montreal, where he had breakfast with the mayor of the city, and then visited Lachine, Quebec  He then passed through Ottawa and Toronto, finally reaching Clifton Hill, Niagara Falls on 22 December 1871 by the Great Western Railway. On his way, the train stopped in Hamilton, Ontario where he received a telegram from Queen Victoria, notifying him that the Prince of Wales had recovered from his illness. From Clifton Hill the party left by sleighs for a visit to the Niagara Falls. After having dressed in oil-skinned suits for fishermen at sea, the party also went under the falls. The Grand Duke then crossed the Niagara River over new suspension bridge and then visited the United States part of the falls. "We have but little to exhibit but the ruins and débris of a great and beautiful city and an undaunted people struggling with adversity to relieve their overwhelming misfortunes." The Grand Duke visited the destroyed part of the city and was impressed by the rhythm of the reconstruction. He gave $5,000 USD (equivalent to $250,000 today) in gold to the homeless people of Chicago. As an irony, the same day Grand Duke Alexei arrived in Chicago, a special Grand Jury indicted thirteen members of the city's Common Council on charges of bribery. Grand Duke Alexei also visited the stockyards and a pork processing plant. As the Tremont House Hotel had been burnt to the ground, the Grand Duke was accommodated in the New Tremont House which had opened on Michigan Avenue, where he was awarded the "Freedom of the City". On New Year's Day General Philip Sheridan initiated him into the American custom of making "New Year's calls upon the ladies". From 2 to 4 January Grand Duke Alexei visited Milwaukee and on 5 January he arrived in St. Louis, Missouri, where he stayed for over a week. In St. Louis, Grand Duke Alexis attended a burlesque show Buebeard in which Lydia Thompson, a 36-year-old actress was singing a tune "If Ever I Cease to Love". It is claimed that the Grand Duke was fascinated both by the actress and the song. Supposedly, she had also sung the number privately for the duke during a rendezvous. Later, while in St. Louis, Alexei became particularly enamored of one of his dance partners, a lady called Sallie Shannon of Lawrence, Kansas. Cody had discussed the hunt with Spotted Tail, chief of the Brulé Lakota, who had agreed to meet the "great chief from across the water who was coming there to visit him." About 600 warriors of different Sioux tribes, led by Spotted Tail, War Bonnet, Black Hat, Red Leaf, Whistler and Pawnee Killer, assembled to greet the grand duke at the hunting camp. They had been provided with ten thousand rations of flour, sugar, coffee, and 1,000 pounds of tobacco for their trouble - twenty-five wagon loads in all. At the start of the party, Spotted Tail, dressed in a suit, which didn’t fit him, with an army belt upside down and an extremely awkward look was introduced to the Grand Duke. Then the Indian chief extended his hand, and greeted the Grand Duke in Lakota saying "How." Grand Duke Alexei received as a gift from chief Spotted Tail an Indian wigwam and a bow and arrows. The Grand Duke took them back to St. Petersburg. At present they are kept at the museum in Tver. In memory of his adventures in the America, the Grand Duke organized every year a special entertainment. The actors arrived to a village of tents in old carriages drawn by heavy horses. On the palaces lake there were "Indian" pirogues. Men with swords and tomahawks danced with women dressed in long old skirts. The performance was supposed to give the attendance an image of the American Old West. 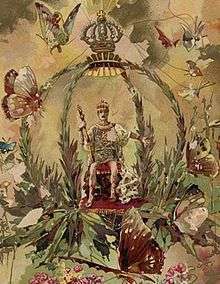 In New Orleans Grand Duke Alexei Alexandrovich attended the 1872 Mardi Gras celebrations, where he was guest of honor reviewing the inaugural Rex parade. There are many legends related to the Grand Duke's visit to New Orleans. Though it has been claimed that local business leaders had planned the first daytime parade to honor the Grand Duke, but this was not true. New Orleans was struggling to recover from the lingering effects of the Civil War. At the same time, many city leaders saw the need to bring some order to the chaotic street parades of Mardi Gras day. They had planned the parade all along and took the opportunity to capitalize on the Grand Duke's visit. A new krewe of prominent citizens was formed, calling itself the School of Design and its ruler was to be Rex (the organization is now known as the "Rex Organization"). The group of young men who founded the Rex Organization hoped not only to entertain the Grand Duke, but also to create a daytime parade that would be attractive and fun for the citizens of the city and their guests. They selected one of their members, Lewis J. Salomon, the organization's fund-raiser to be the first Rex, King of Carnival. Before he could begin his reign, he had to borrow a crown, scepter, and costume from Lawrence Barrett, a distinguished Shakespearean actor who was performing Richard III at the Varieties Theater. At the same time, Lydia Thompson's tour had reached New Orleans and the Bluebeard burlesque was staged at the Academy of Music on St. Charles Avenue. Rumours of the courtship between the Grand Duke and the actress had reached New Orleans and were amplified mainly to ensure a full house. The Duke had already seen the performance and was a no-show, hanging out at the Jockey Club. Besides, the Grand Duke's preferences had shifted and he was captivated by the diminutive actress Lotta Crabtree who had one of the main roles in the play The Little Detective. Though the encounter was brief, Alexis sent her a bracelet of diamonds, opals and pearls in Memphis, her next stop after New Orleans. If Ever I Cease to Love"
The Grand Duke never rode a buffalo in Texas, but Nebraska doesn’t rhyme with Alexis. It is also claimed that the Grand Duke was also given the honour of selecting the official colours for Mardi Gras, and using the heraldic traditions, selected purple for justice, green for faith, and gold for power. The claim that these were the colors of the Romanov family is however incorrect. The Meaning and Origin of Purple, Green, and Gold in Mardi Gras Rex selected the official Mardi Gras colors in 1872. The 1892 Rex Parade theme Symbolism of Colors gave meaning to the colors: purple represents justice; green, faith; and gold, power. If any credence should be given for the colours being chosen by Duke Alexis Romanoff himself, then it may well be for the exotic citrus-based drink he introduced to New Orleans locals during that visit, which embodied lemons, limes and variant on the dark purple tonics of the day. (Lemon|Gold, Lime|Green, Tonic|Purple). This drink had been used as a cure for scurvy in the British Navy, In 1747, Lind, an officer and naval surgeon in the British Royal Navy, established the fact that oranges and lemons were effective in curing scurvy. He divided patients into 6 groups of 2 and gave each group a different remedy. Only the group given oranges and lemons recovered. The British used predominantly lime juice instead of lemon or orange juice to prevent the disease, and the sailors became known as limeys. The Grand Duke had lobbied, unsuccessfully, to have this drink adopted widely in the Russian Navy and although not officially adopted, the Grand Duke ordered the drink to be taken daily by his crews, and rates of scurvy among his men vanished. The drink was an instant hit among the attendees of Mardi Gras that year. The drink still survives today as a local recipe in New Orleans and various parts of the state of Louisiana as Citron, Chaux et Bitter. The Russian fleet set sail from Pensacola, Florida of 22 February 1872. It is claimed that hundreds of pounds of iced buffalo meat were carefully stowed aboard. While Libbie Custer, General Custer's wife, believed the grand duke was more interested in "pretty girls and music" than the country he was passing through, Alexei did spend most of his time trying to get an understanding of the country. The Russian squadron then stopped in Rio de Janeiro where it arrived on 3 June 1872. The Grand Duke entertained Emperor Pedro II of Brazil and the imperial court aboard the Svetlana. The Brazilian emperor awarded him the Imperial Order of Dom Pedro I. The Grand Duke looked slightly disappointed and said that he had hoped for the Imperial Order of the Rose, a lower order, because he had never seen a more beautiful order. Pedro II graciously awarded him both orders. Thereafter, he spent several days in Brazil, leaving on 9 June. On 15 October 1872 the Russian squadron cast anchor in Nagasaki harbour, where he was greeted by the governor. The program of the Grand Duke included a ceremonial dinner in his honour, visits to the surrounding countryside and a tournament of the 60 best wrestlers of Japan. On 22 October Alexei and his staff visited the little village of Inasa where a Russian colony lived. The Russian delegation visited two hotels named "Kronstadt" and "Moscow" as well as the Russian cemetery. The Russian squadron left Nagasaki on 24 October, the next port of call being Kobe, where the Grand Duke was again greeted by the provincial governor. The Russians were surprised by the jinrikshas which they saw for the first time. They used rickshaws for their trip to the Nunobeki water falls in the proximity of the city. Grand Duke Alexei also attended a performance at the local theatre in Kobe. On 1 November the Russian squadron set sail for Yokohama. The Grand Duke was met by Prince Arisugawa Taruhito, the Daijō daijin (Chancellor of the Realm) who escorted him to Edo Castle. At the castle Alexei met Soejima Taneomi Head of the Gaimushō (Department of Foreign Affairs). who made the arrangements for the accommodation and the entertainment of the Russian delegation. On 5 November, the Grand Duke was officially received by Japanese Emperor Meiji. Emperor Meiji, presented his portrait a gift for the Tsar, the first time ever a Japanese emperor's portrait was given to a foreigner, and asked for a portrait of Alexander II in return. The Great Prince Alexeis promised to send the portrait as soon as he got back to St.-Petersburg, and, as soon as he came on board the Svetlana, sent his own portrait to thank the Mikado. The exchange continued and, the next day, the Emperor sent over the portraits of his spouse and mother. On 9 November, Alexei and the Mikado viewed the parade of the Japanese armed forces, and upon his return to the palace, he was introduced to the Empress Masako. After a few days, the Mikado at the invitation of the Grand Duke, the Mikado went to Yokohama to see the Russian squadron. Following the Grand Duke's intervention, 34 Japanese Christians were pardoned by the Mikado and released. On 26 November the Russian squadron set sail for Vladivostok reaching the base of the Russian Pacific Fleet on 5 December nearly a year and a half after it had left from Kronstadt. He then returned to St. Petersburg across Siberia. In 1874, Alexei accompanied his father to England, to visit his sister the Grand Duchess Marie Alexandrovna, recently married to Queen Victoria’s son Prince Alfred. After his return from America, Grand Duke Alexei was concerned about an appropriate residence. He purchased an older building located at 122 Moika River Embankment in Saint Petersburg. The building was completely redesigned and rebuilt by architect Maximilian Messmacher having a total surface of 9,200 sq.m. It is considered one of the most interesting examples of Saint Petersburg's eclectic architecture. The architect used a different style for each façade. The wrought iron and stone fence surrounding the palace and its gardens is also an interesting feature. The central gates are still ornamented with the Grand Duke's monogram, the meaning of which was overlooked by the Soviet authorities. In 1910 part of the gardens were sold for the construction of a candy factory. Though the palace was declared a national landmark in 1968, it remained in disrepair for many years. After a restoration in the early 2000s it was reopened in 2008 as the St. Petersburg Music House. In 1873, Grand Duke Alexei Alexandrovich was appointed head of the Imperial Naval Guards. He was also appointed member of the section for shipbuilding and naval artillery of the Russian Naval Technical Committee. During the Russo-Turkish War (1877–1878) he was promoted commander of the Russian Naval Forces on the Danube. On 9 January 1878 he was distinguished with the Order of St. George – Fourth Degree for "tireless and successful management of the naval forces and equipment on 14 June 1877 for the construction and maintenance of the pontoon bridges and crossings at Zimnicea, Pietroşani and Nikopol and for the successful measures for protecting these crossing from destruction by enemy forces." In 1880 he was promoted general adjutant. In 1882 after the accession of his brother Alexander to the throne, Alexei was appointed head of the Naval Department, replacing Grand Duke Konstantin Nikolaievich. In 1883 he was also appointed General-Admiral of the Russian Imperial Fleet. Though his control over the day-to-day affairs of the military was limited, Alexei was involved in naval and military planning. His influence over the Tsar gave him a powerful say in strategic decision-making. 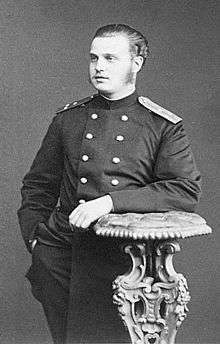 Besides being the head of Russia's fleets, Grand Duke Alexei Alexandrovich was also in command of the naval cadet corps, the Moscow guard regiment, the 37-th Ekaterinburg infantry regiment, the 77-th Tenginsk infantry regiment, and the 17-th Eastern Siberian infantry regiment. He also had older ironclads of the Imperator Aleksandr II class reconstructed by the French La Seyne yard. He also put new cruisers in service (among which the Aurora). The Grand Duke was instrumental in the modernization of the Russian navy. reconstructed and developed of the military harbours of Sevastopol, Alexander III in Livada (now Liepāja, Latvia) and Port Arthur, increased of the number of navy yards and extended the dry-docks in Kronstadt, Vladivostok and Sevastopol. He also reorganized the navy, defining the conditions for different naval qualifications, drafting of rules for rewarding long-time service of first and second rank ship captains, restructuring of the corps of mechanical engineers and naval engineers, increasing the number of officers and crew. When tensions mounted in the Far East, Grand Duke Alexei ordered the transfer of additional ships to Port Arthur, including the battleship Petropavlovsk. Russian academician and naval engineer Alexei Nikolaevich Krylov shows that, despite these achievements, there were severe drawbacks in the Grand Duke's activity. There was no strategic planning and ships were not built based on their intended role within the fleet. There were too many ships of different types. Ships were designed mainly by copying the ones of foreign navies, and were therefore technologically 6–7 year old when they were launched. Their armour and equipment was often inadequate. The Grand Duke seems to have become aware of some these deficiencies. He decided to have more battleships of a single type and to have them designed abroad to meet the needs of the Russian navy. However, though the Grand Duke was an admirer of the British navy, the new battleships were conceived in France and had a poor design. The new Borodino-class battleships had tumblehome hulls and were unstable, having a high center of gravity. The drawbacks proved to be fatal for the Russian navy. At the outbreak of the Russo-Japanese War, in 1904 the Russian First Pacific Squadron was able to resist the Japanese attack during the Battle of the Yellow Sea. However, the squadron was destroyed during the battle for Port Arthur, and the Baltic Fleet, sent for reinforcement was completely defeated in the Battle of Tsushima. 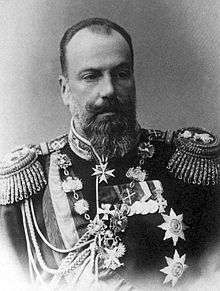 On 2 June 1905 O.S., Grand Duke Alexei Alexandrovitch was relieved of his command and retired. His critics talked of Alexei's life as consisting of "fast women and slow ships", referring to his womanizing and the defeat of the Russian navy by the Japanese. This statement is not justified, because, despite any drawbacks, his contribution to the modernization of the Russian Navy was outstanding. Away from his desk Alexei devoted his time to the good things of life. He entertained generously and collected fine silver and other works of art to adorn his palace. Sometimes he designed his own clothes. A womanizer, he spent his vacations in Paris or in Biarritz, each time in the company of a different lady. Around the late 1880s he started a celebrated affair with the Duchess of Leuchtenberg, the morganatic wife of one of his cousins Eugène von Leuchtenberg. Born Zinaida Skobelyeva, "Zina" was a strikingly beautiful woman who had married Eugeni of Leuchtenberg as his second wife in 1870. Alexander II made her Countess de Beauharnais and Alexander III raised her to Serene Highness and Duchess of Leuchtenberg. Grand Duke Alexei Alexandrovich was so besotted with her that he conducted an affair openly, under her husband's roof and in his full knowledge. Eugeni Leuchtenberg drank away most of his fortune, and for years he and Zinaida lived off his cousin's generosity. Even after his wife's death in 1899 the Duke continued to live under Alexei's roof. Besides his military duties, Grand Duke Alexei Alexandrovich also was chairman of the Imperial Commission for the Promotion of Ballet. In 1904, Grand Duke Alexei Alexandrovich was one of the godparents of Tsarevich Alexei, the other godparents being the Dowager Empress Maria Feodorovna, Kaiser Wilhelm II of Germany, King Edward VII of the United Kingdom, King Christian IX of Denmark, Grand Duke Ernest Ludwig of Hesse, Grand Duchess Alexandra Iosifovna, Grand Duke Michael Nikolaevich, Grand Duchess Olga Nikolaievna. 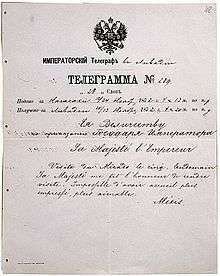 Besides, all soldiers serving in the military during the Russo-Japanese War were declared godfathers to Alexei. After the assassination of his brother Grand Duke Sergei Alexandrovich of Russia in February 1905 and his retirement in disgrace from the navy in June that same year, Alexei Alexandrovich spent most of his time in the Paris house he had bought in 1897. At his house in Avenue Gabriel he kept an open door for writers, painters, actors and especially actresses. He had always been less interested in the armed services than in art and fashion, and he had long since been recognized as a connoisseur of the social, artistic and literary life of Paris. His massive frame was a familiar sight at restaurants and theaters, particularly on first nights. His last public appearance, a week before his death, was at the dress rehearsal of a new play at the vaudeville. Decades of comfort and good living eventually took their toll on the Grand Duke's health. He died of pneumonia in Paris on 27 November (14 November O.S.) 1908. His death was said to have devastated Tsar Nicholas II, his nephew, who reportedly claimed Alexei as his favourite uncle. In 2006 the diary of Grand Duke Alexei Alexandrovich was found in the Russian National Library along with Yussupov funds. The journal, written in English, begins in 1862 and ends in 1907. It has not been published yet. "The Adventure of the Seven Clocks", part of The Exploits of Sherlock Holmes collection, deals with attempts of the Nihilist movement to assassinate the Grand Duke. The Grand Duke's western hunt is alluded to in the film version of Maverick, starring Mel Gibson. In the film, the Duke is hustled, after he has grown bored with hunting animals, into thinking he has killed a Native American. He is also described by Boris Akunin in his novel The Coronation of the Last Romanov (Коронация, или Последний из Романовых) where he is presented as the character Georgi Aleksandrovich. The 1973 Lucky Luke comic book Le Grand Duc features a Russian Grand Duke who visits the Wild West. Wikimedia Commons has media related to Grand Duke Alexei Alexandrovich of Russia. 1 2 "White House - Royal And Titled Guests, 1908". Oldandsold.com. 24 February 1902. Retrieved 2012-09-02. ↑ "The Season of Opera". New York Times. 2 December 1871. Retrieved 2012-09-02. ↑ "Return of the Grand Duke". New York Times. 6 December 1871. Retrieved 2012-09-02. ↑ "Duke Alexis in Boston]". New York Times. 9 December 1871. Retrieved 2012-09-02. ↑ "About Carnival". Nola.com. Retrieved 2012-09-02. 1 2 "The Hunt of the Grand Duke Alexis". Kancoll.org. Retrieved 2012-09-02. ↑ From the Schoharie Republican, 11 Jan.. (14 January 1872). "Buffalo Hunting by the Grand Duke". New York Times. Retrieved 2012-09-02. ↑ The Grand Duke Alexis Archived 26 May 2008 at the Wayback Machine. ↑ "Andreas' History of the State of Nebraska". Kancoll.org. Retrieved 2012-09-02. 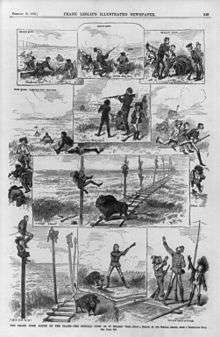 ↑ "Buffalo Hunt in Nebraska by the Grand Duke Alexis of Russia in 1872". Americahurrah.com. Retrieved 2012-09-02. 1 2 3 Артем Кречетников. "Артем Кречетников Царская охота в прериях Небраски". BBC News. Retrieved 2012-09-02. ↑ [ Displaying Abstract ] (30 January 1872). "The Grand Duke Alexis". New York Times. Retrieved 2012-09-02. ↑ "Errol Laborde - Mardi Gras.- History 2: The First Bathurst". Webcitation.org. Archived from the original on 26 October 2009. Retrieved 2012-09-02. ↑ Vatican Lokey. "History of Mardi Gras in New Orleans –". Carlnivale.theatricana.com. Retrieved 2012-09-02. ↑ Ned Hémard - New Orleans Nostalgia "She Was Only the Stable Master's Daughter"
↑ "Rex King of Carnival". Rexorganization.com. Retrieved 2012-09-02. ↑ "Discovery of the American West". Memory.loc.gov. Retrieved 2012-09-02. ↑ "The Alexander Palace Time Machine". Forum.alexanderpalace.org. Retrieved 2012-09-02. ↑ From Our Own Correspondent. (23 July 1872). "Brazil". New York Times. Retrieved 2012-09-02. ↑ "China: The Grand Duke Alexis". New York Times. 16 November 1872. Retrieved 2012-09-02. 1 2 Imperial Russian State Council, 1902 Archived 5 July 2008 at the Wayback Machine. ↑ "А.И. Барковец - Визиты В Японию Великого Князя Алексея Александровича". Rosizo.ru. Retrieved 2012-09-02. 1 2 "Алексей Александрович". Rulex.ru. Retrieved 2012-09-02. ↑ Palace of Grand Duke Alexei Alexandrovich Archived 30 June 2007 at the Wayback Machine. ↑ "Palace of Grand Duke Alexei Alexandrovich". Fontanka.ru. 27 June 2007. Retrieved 2012-09-02. ↑ "Romanovs of Russia". Freewebs.com. Retrieved 2012-09-02. ↑ Journal of Grand Duke Alexei Alexandrovich Archived 20 July 2008 at the Wayback Machine.